At first blush, eating at the beach should not strike one as the most ideal proposition. Food beneath a blazing sun, often in high winds, and surrounded by sand is food that is imperiled. Yet, eating on the beach is unquestionably embraced worldwide. Some places do beach food better than others (Chileans used to try to sell me boiled eggs at the beach), but none do so better than the Brazilians. Where my wife grew up going to the beach in Florianopolis, restaurants are built on the border between beach and non-beach so that the back (or front depending on your perspective) opens right out onto the sand where plastic furniture and umbrellas are stationed to receive patrons. One simply wanders up from the beach, sits down at an empty table, and within minutes you can order a full meal, or maybe just a caipirinha. When you finish, you could do a straight dash into the waves a few yards away, should you be so inclined. If the formality of sitting at a table is too much for your beach sensibilities, then many push carts selling sausages, seafood, mixed-drinks, etc. are constantly shuffling up and down the shoreline for your dining or drinking pleasure--health codes be damned! Even Batman needs a summer job sometimes. Here in the States, at least in my experience, things swing a little differently--no doubt due to legal restrictions. Out in San Diego there were places where I could walk up to from the beach and sit down at a nice deck, but that's really just beach-side dining. Still, it beat anything we had at Tybee back in the day. When we were growing up, going to the beach at Tybee was a full day proposition. In those days, before the Truman Parkway, it was a solid hour from Coffee Bluff out to the beach. That meant we had to consider our meals. For our family, that translated to a big cooler full of sandwiches, sodas, and often grapes. However, if we were spending the week out at Tybrisa, as we did most years, we would plan at least one night out to eat at Spanky's, where if the parking lot out front is empty you can still see the ocean. Things are changing, ever so slowly. There is now at least one place on the island where you can in fact walk up from the beach, take a seat, and have a surprisingly delicious meal. Following in a now long Savannah tradition of opening a new restaurant with "The" in the title, we get The Deck. I first heard of the place from a student of mine who cooks at Collins Quarter. He kept talking about having to go to the "new place" on Tybee, and I thought he was just confused until he showed me the Facebook page. Around that time other food writers started to publish stories about the new venture from the Collins Quarter people that replaced Marlin Monroes, so the wife and I decided to have ourselves a beach day and check out the "Grand Opening." The space isn't new, but I can't say I'd ever seen it before so I'll count it as new (apparently they renovated and built out the new space in less than a month's time). There is in fact a deck, and it was there the wife and I found ourselves sitting on a beautiful May afternoon. 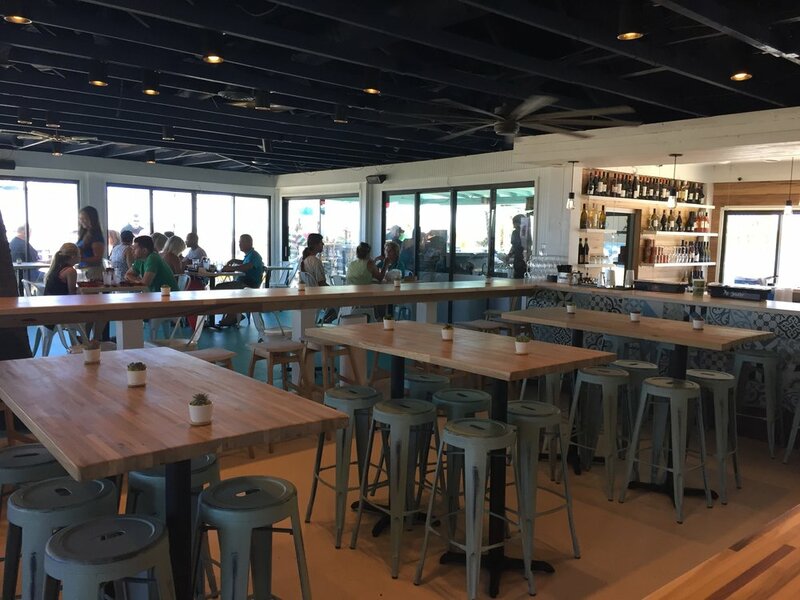 You can enter the deck of The Deck from the dunes, right off the beach on the northern end of the Island, but to be seated you still have to walk into the restaurant and approach the host stand in the "front." Hopefully this is a kink they will work out with time. The views are what you hope for, and Tybee really does look pretty from a high top. You could almost mistake the water for blue. If it is too hot out, the inside of the restaurant looked very nice as well. Inside might also be preferable as the sand gnats were pretty intense there in the dunes (it is still the Coastal Empire after all) and we ate a couple of grams of bonus protein because of it. There is an indoor and outdoor bar, and soon they are opening a swimming pool. It is an exciting space, and completely unexpected on Tybee Island. Even without the view, the menu was impressive. I mentioned San Diego earlier because the manager apparently brought a lot of Southern Californian influence to the resto, and it shows. The food though is thoroughly hybrid, with lots of Mexican and Hawaiian influences as well. The menu, as you can see, reads "smallish" and "time to eat" which led us to assume that the portions were indeed small and pricey (a sad reality in a lot of places these day.) That turned out to be a completely false assumption (and we all know what assuming does, right?) and we over-ordered considerably with the Aloha! Tuna, the Buffalo hog wings, and the Swine Time Burger. Let's look at some pics and then I'll dish on the dishes. Swine Time Burger. In the background you can see the damage I did to those hog wings. The tuna was Hawaiian "poke" style with a whole avocado piled onto the plate for good measure. The chunks of tuna were fresh, firm, and lovingly seasoned. I almost couldn't stop eating them. They go well with the avocado and the crunchy bits give a nice contrast. This was a winner and definitely a plate that is evocation of "beach." The hog wings though were one of my favorite dishes anywhere in a long time. They take pork shanks, with the bone in, sous-vide them until perfectly cooked, flash fry them, and dress them like buffalo wings. You can literally eat them like wings--but they're pork! It was a revelation. The "wings" came on a bed of fried green onions and jalapenos that were addictive. If you've ever had green bean casserole with the french's fried onions on top as a Thanksgiving dish, and wished all the while that you were only eating the crunchy topping, then you'll be delighted with the hog wings for sure. We were so full from the two "smallish" dishes that we almost couldn't handle the burger, covered as it was with bacon, jalapeno "fondue", and a mustard based BBQ sauce. However, we are professionals and in the interest of you, Dear Readers, we ate the whole thing. In my never-ending Burger Quest, the Swine Time has charged in and taken the number one spot in Savannah (I still love you, Rue de Jean Bistro Burger!) The patty was perfectly char-grilled, the toppings worked like a symphony of sweet, savory, and spicy, and the whole eating experience was pure comfort. It may be a bit heavy for the beach (it was a struggle to eat some of those tasty fries...a valiant struggle), but it may be worth the trip to Tybee in and of itself. ...or rather a "Caipirnha." I suppose you can't have everything. As mentioned, we were there on the "Grand Opening", so things will inevitabley change over time and probably drastically once the high season ends. I do hope those changes will be for the better, but you never know on an Island. My suggestion is to check out The Deck soon. Here are a few more photos for you enjoyment.